Would you like to have some junk food? Mash the potatos, add the salt and butter and start mashing. Slowly add milk and keep mashing the mixture until is is very smooth and creamy - and not too liquid! Slowly add the flour until the mixture. Form balls of the mixture and put them on a wooden board. Let them sit in the fridge for half an hour. Put the other egg on a plate. Take another plate and put breadcrumbs on it. 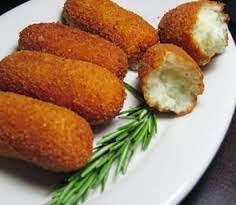 Take each individual croquette, turn it in the whisked egg so it is completely coated in egg and then in the breadcrumbs .